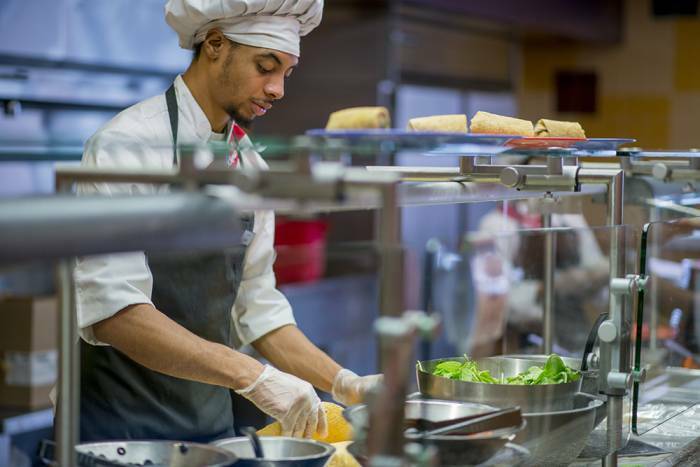 Dining halls are staffed and operated by Sodexo Campus Services, the premier dining and food service contractor in the industry, and are committed to quality and excellence. Pittsburg State University Housing and Sodexo provide students with continuous dining from 7:30 a.m. - 8:30 p.m., Monday through Thursday, 7:30 a.m. - 7 p.m on Friday, 11 a.m. - 6 p.m. on Saturday, and 11 a.m. - 7 p.m. on Sunday. Patrons of the Gibson Dining Hall are able to choose from a wide range of delicious hand made selections in an "all you care to eat" format. Want something fresh and light? Build your own salad at our Gibson Salad Bar or watch one made just for you while you wait. Looking for comfort food? Choose a selection from our "Taste of Home" menu. In a rush? Grab a slice of freshly baked pizza or build your own sandwich at our deli bar. We also offer a Vegan Bar, gluten free options with our "Simple Servings" menu, homemade soups, and freshly baked desserts and soft-serve ice cream. Whatever you're in the mood for, you'll find it at Gibson Dining Hall! This plan provides students with unlimited, personal access to Gibson Dining Hall during dates and hours of operation. This plan provides 14 personal accesses per week to Gibson Dining Hall plus $100 in Dining $'s per semester to spend at any university food service operation. This plan provides students with 14 accesses per week to Gibson Dining Hall. This plan provides students with 10 accesses per week to Gibson Dining Hall. This plan provides 10 personal accesses per week to Gibson Dining Hall plus $100 in Dining $'s per semester to spend at any university food service operation. The Dining Dollars plan provides students with maximum flexibility in that Dining dollars spend like cash at any of the University food service operations. Dining dollars purchases made in Gibson Dining Hall are tax free. Unspent Dining dollars from the fall semester may be carried forward into the spring semester but all Dining dollars must be used by the end of the spring semester or be forfeited by the student. All first year students must select either the 7 Day Access Plan or the 5 Day Access Plan/$100 Dining Dollars Meal Plan. This plan provides students unlimited access to Gibson Dining Hall during dates and hours of operation. Come in for a meal, a snack, or just enjoy a beverage while you study. This is our most economical plan, perfect for a healthy snacker or someone with a hearty appetite. The 7 Access Day Plan ensures that your meal plan will last through the end of the semester. This plan offers flexibility, convenience, and value. Participants receive a guaranteed 160 meals for the semester in Gibson Dining Hall and $100 dining dollars to use in the other university food service operations. With approximately ten meals per week in Gibson Dining Hall and dining dollars for other meals and snacks, this plan has the flexibility to work with anyone’s busy lifestyle. The 160 meals are per semester and any unused meals at the end of each semester expire. This plan provides students with maximum flexibility in that Dining Dollars spend like cash at any of the University food service operations. Unspent Dining Dollars from the fall semester will be carried forward into the spring semester, but all Dining Dollars must be expended by end of the spring semester or forfeited. Students may make changes to their meal plan for each semester up until three weeks from the original starting day of classes (as listed in the official university calendar) for that semester without any additional change fees, however meal plan charges would change accordingly. First year students required to purchase the Seven Day Access meal plan or the 14 Access meal plan may only choose to move to one of those two meal plans for the semester. Students not required to purchase the Seven Day Access meal plan or the 14 Access meal plan may choose to move to any other meal plan until that time. Request to change to a higher meal plan can be done at anytime. Students must come to the University Housing Office, 209 Horace Mann Hall, to complete proper paperwork. No refunds or credits will be made for missed or unused meals. The university may suspend meal privileges if the student fails to make payments on time, fails to abide by all terms of the contract, or fails to appear at a University Housing discipline hearing.